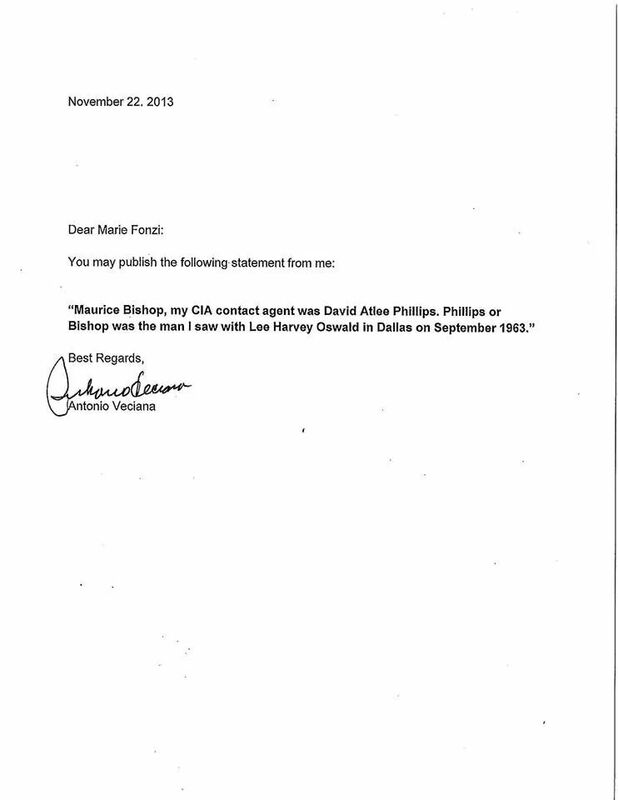 On November 22, 2013, Antonio Veciana confirmed in writing that David Atlee Phillips was the man he knew as Maurice Bishop and who met Oswald in September 1963. Letter below courtesy of Dan Hardway and Marie Fonzi. As Dan Hardway rightly noted today – why didn’t Veciana confirm this in 1978 when it could have blown the case wide open? Antonio Veciana was interviewed just a few weeks ago, here. It includes a video interview too, but I don’t speak Spanish. Translated, the article says in part, “Antonio Veciana, an anti-Castro activist who said he saw Oswald with his CIA contact in Dallas weeks before the murder, said in an interview that Kennedy was the victim of a plot by senior military and intelligence officials. Veciana said these officials were angered by the failure of the Bay of Pigs, the negotiations with the Soviet Union that ended the missile crisis and the perception that Kennedy sought to improve relations with Cuba. ANOTHER IMPORTANT UPDATE RE: ANTONIO VECIANA- HE IS ALIVE (! ); someone is playing games on the matter of his life status. Per renowned author and researcher Scott Kaiser, who JUST SPOKE TO HIM: “I don’t know where your getting your information from, but Antonio is very much a live I just got off the phone with him 5 minutes ago. In-fact I have a video of him giving me that very statement you posted, he asked that I call him back on Monday because he was in a meeting with some of his vendors, he wants to talk to me, I will be recording our conversation. 8) Alleged long-suppressed film depicts second gunman? Vince, how about Ruby’s grip on the gun when he shot Oswald? By now even the main stream press is acknowledging that Ruby stalked Oswald before he finally did the deed. But even more important is the assassin’s grip that Ruby uses to hold the gun. Just check out that Pulitzer winning picture and note how Ruby is using his middle finger on the trigger and his index finger is curled over the gun to prevent it from being knocked out of his hand. Would be interested to hear your thoughts on this piece of the Ruby as hit-man puzzle. Came back here again Vince by accident. Any updates on the secret assassination film story? Hope you’re well. Gotta order the NSSS and Who’s Who. Hi! I haven’t heard anything since and I severely doubt we ever will now.